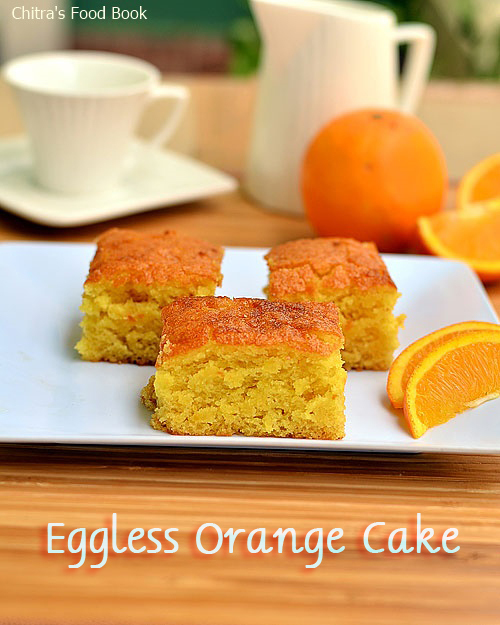 I usually make eggless orange biscuit cake and its our family favorite too.But this time I tried an eggless, butter less orange sponge cake recipe using fresh orange juice.This recipe is without condensed milk,curd and it’s a vegan version too.I referred this recipe and used cooking oil to achieve the softness.Cake came out very well with bursting orange flavor.I loved its color,texture,flavor and above all it was like pillow soft to touch and eat.I was completely satisfied with the result and patted myself for this successful baking .I am happy and double confident that this cake is going to be a super hit among my family members.I am waiting for Raksha to come back from school and taste it.I guess this cake can be made with wheat flour too.I must give a try.Lets see how to make this easy,low fat vegan orange cake recipe with stepwise pictures. 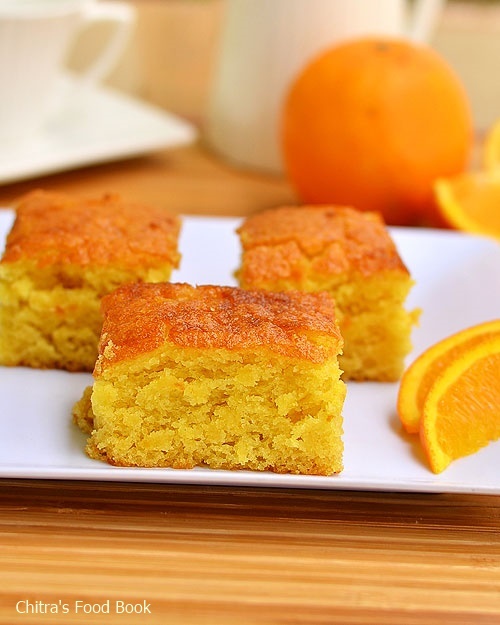 Eggless orange cake recipe without egg,butter,cream,condensed milk and curd. In a wide bowl,sieve the maida,baking powder,soda and salt.Mix well.Add the orange zest to it. ( I grated the skin of orange and mixed with the flour) Set aside. Grease a baking pan with oil or butter and sprinkle the maida all over the pan.Keep aside. In another bowl,mix the sugar,oil and orange juice. Use a whisk and stir the mixture until the sugar dissolves well. Add the flour to the oil mixture and mix it with a spatula or whisk in one direction.Do not over beat the mixture. Cake will not rise.The batter should fall like a ribbon.This is the right consistency. Preheat the oven in convection mode at 180c for 10 minutes.Pour the batter in the baking pan and pat its bottom once for even distribution of batter.Now bake the cake in convection mode at 180c for 30-35 minutes.Check the cake by inserting a tooth pick in the center of the cake after 30 minutes.If it comes out clean or with little crumbs,cake is done.If u find the wet batter in the tooth pick,bake the cake for 2-3 minutes more.Invert the pan in a plate after the cake is cooled down.Cut into slices and enjoy with Tea. Please adjust the timing based on the convection oven..
You can replace oil with softened butter. You can also use canned orange juice. No need to use water,curd or milk.Orange juice would do. Do not invert the cake as soon as u bake.Cake will break.If the cake doesn’t fall off easily,bake it for 2 more minutes. Enjoy this cake for your tea time.Tastes awesome ! 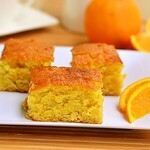 I love to use orange juice in the place of eggs, the cake comes out so fluffy, nice pics Chitra.. Delicious cake....would love to try it! Is it possible to do the same n pressure cooker? Hi, May i know what problem u faced ? If you are not comfortable in using water inside pressure cooker,try using salt or sand.It works.Please use only aluminium pan inside cooker and not steel ones. 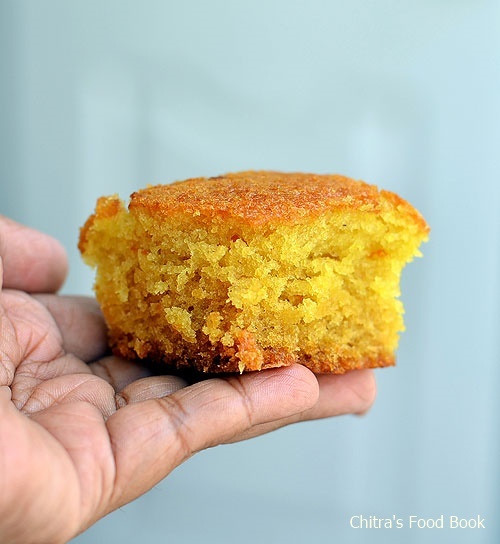 Yes u can use.But refer this recipe link for spongy vanilla cake.Here just skip tutti frutti and follow the same recipe. It's a no fail recipe that always always turns out brilliant!! kudos! Thanks for this recipe, I baked it for my daughter's 2nd Birthday and it turned out great! I was a bit apprehensive of how it would turn out since the little experience I have with eggless cakes gave me the idea they are usually very dense and a bit dry. But this one turned out fluffy, moist and delicious. It disappeared in no time, I should've made two since they don't really grown that much. Thanks for the great feedback. It made my day ! Hi chitra. Tried this recipe.cake turned out very moist. I've used wheat flour. .kids loved it. Looking forward to more eggless recipes. Hey..as I have mentioned earlier..have made this cake at least 40 times by now.. Turns out super awesome Everytime..will try it with whole wheat this time..
Hi..this Time I tried the same recipe with whole wheat..turned out great as well..also put a small batch of mini cupcakes..the taste for the cupcakes was good...but came out a bit dry. Thanks for the feedback 😊 i have not posted orange cupcake recipe. I will make one soon. Hi. 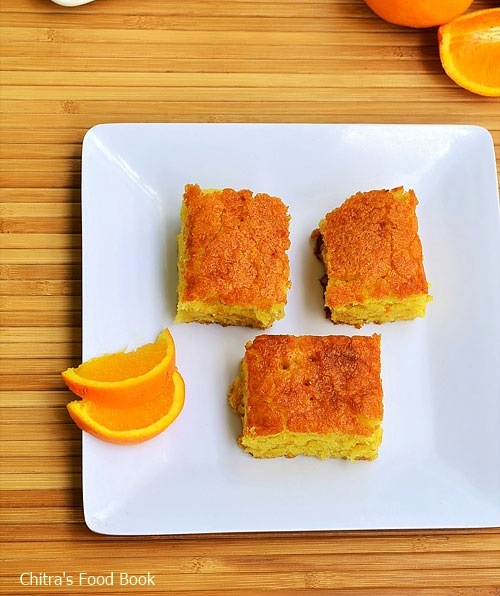 Can i use this measurement for orange muffin? Thanks a lot for the feedback :) Cake cracks due to over hot oven.It also cracks if the quantity of soda or baking powder goes slightly high.Next time when u try,just reduce a pinch of baking powder. U may get it perfect ! Hi, can I use self rising flour as self rising flour comes with baking powder. thanks for a great recipe! with an overflowing orange tree i have made this cake countless times this season. it's become a hard favourite! Thanks for this recipe! I have made this cake many times. I replaced half the oil with yoghurt and even with this change the cake turned out awesome! I want to try this recipe, looks really good!!! i have one question though, what size cake pan did you use and can i use a 9inch round one?! Hey and thanks so much for this recipe! I really want to try it, but I have one question. What size cake pan did you use?! can i use a 9inch round pan instead? I have used 7 inch pan. Yes you can use but size (height) of the cake would be lesser than this. Hi Chitra,would like to make this for my moms bday but I have 240ml cup,can I have the ingredients in terms of gms? Hi, there won't be much difference. You can add 1.25 cups of maida, 1/4 cup oil, 3/4 cup orange juice and reduce 2 tbsp sugar from 3/4 cup. Baking soda and baking powder can be the same but use levelled quantity. Hope this helps. Please let me know your feedback. Will definately be trying this, looks great. Thanks for sharing!